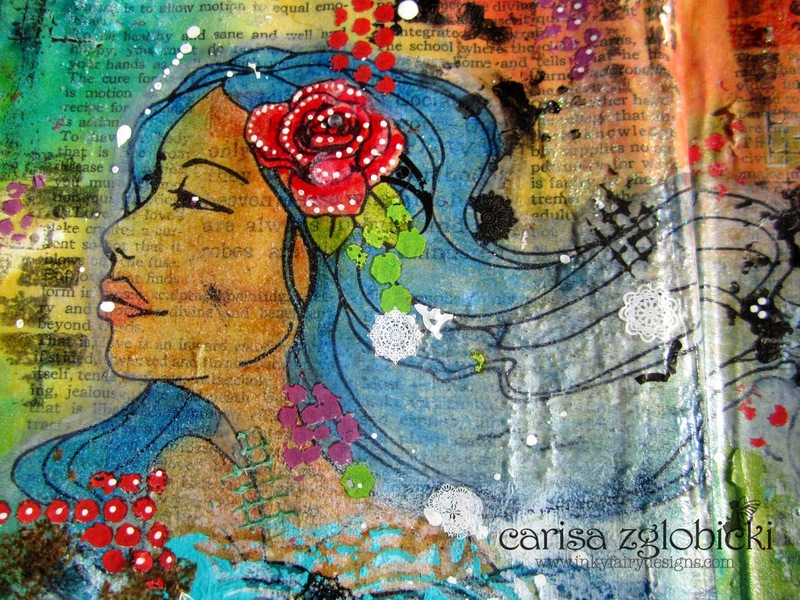 Welcome to Mixed Media Monday - well, it IS still Monday here - even if only for 3 more hours! I wanted to get this posted earlier but it was super cloudy and rainy yesterday so I couldn't get good pictures until today. I thought it might be fun to share a new mixed media project on Mondays - kind of like Watercolor Wednesday - it might not be EVERY Monday, but I'll do my best! 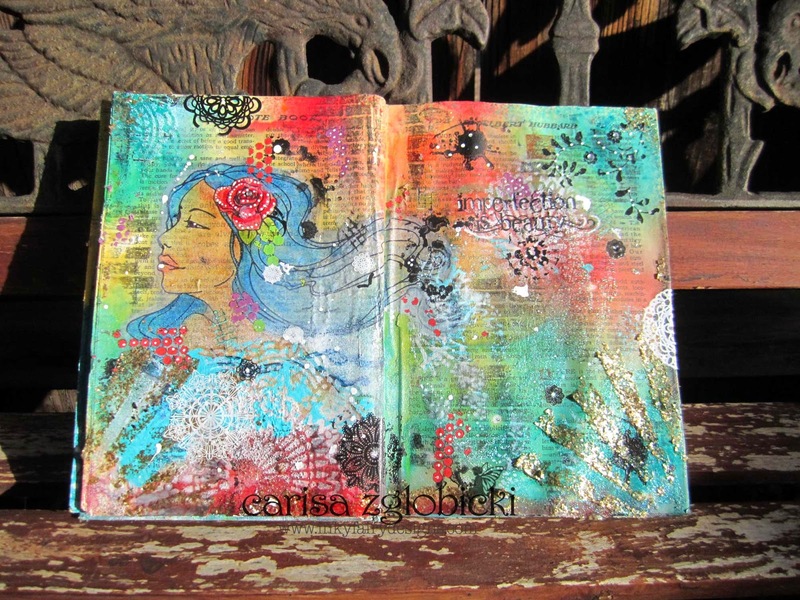 I had the background already created by applying a coat of clear gesso directly to the pages of the book and then adding a variety of Dylusions sprays while it was still wet. I do this because I want the Dylusions to be permanent while I add other mediums to the page and they are not if I just use them on their own. When the gesso dries because it dries clear all you are left with are the sprays. It's an awesome way to use all the beautiful sprays out there that are not normally permanent. After I stamped my image and colored it, I added some Design Memory Craft Glass Bead Glitter Gel in different areas using a palette knife. I love the texture this leaves and because it dries clear you the glitter picks up the color of the background underneath. Super cool! 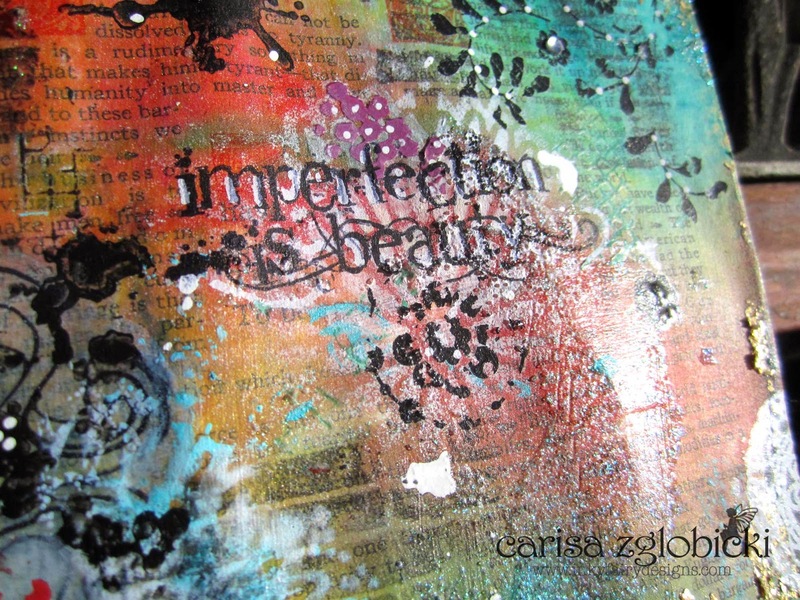 I added some texture using the Brick Wall & Ink Splats stamps by Visible Image - I also stamped my sentiment "Imperfection Is Beauty" by Visible Image. This is my favorite part of my art journal. I have loved these Prima Bloom Girls designed by Jamie Dougherty since they were released and I finally go my hands on a couple at a Scrapbook Expo last month. 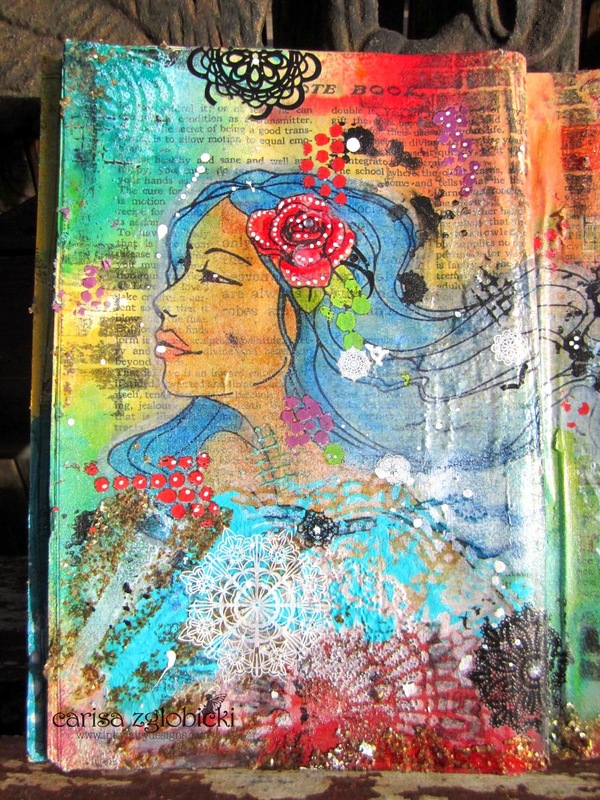 Since I can't draw I love that I can stamp these into my art journals, color and make them my own. I stamped the image onto white tissue paper and then added it to my page with DecoArt Decopauge. Since the tissue paper is see through I was able to turn the stamp the other way to fit on my journal better. The white highlights and splatters were made using a Sharpie White Oil pen. One of them broke as it kept leaking out so I ended up just dripping it around the page and love the ink splattered look it added. Finally, I finished page using rub ons and this Golden Gold Mica Medium with a Tim Holtz stencil and then rubbing the excess along the edges of the page. I love the chunky texture it leaves behind! 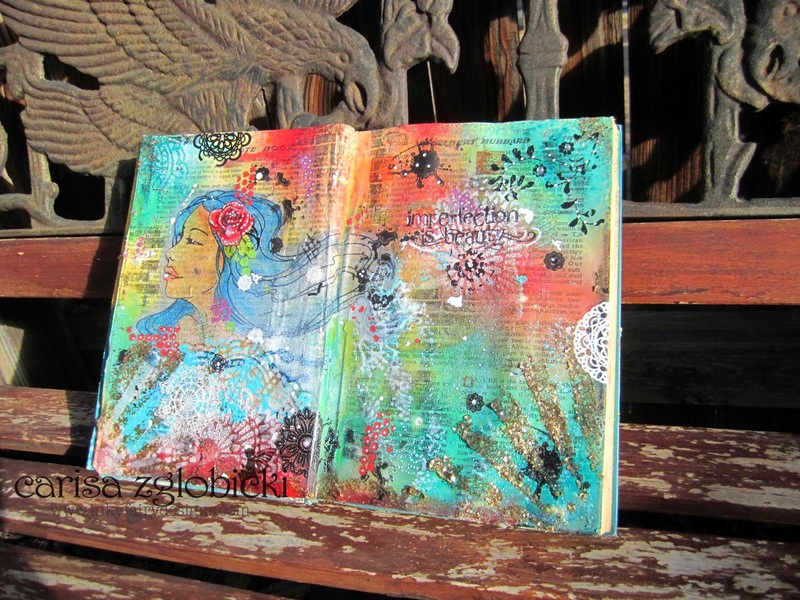 This art journal is an old book I picked up at a thrift store. I love playing in it using new techniques and products. I also love the text background each page has or I can cover it with gesso to have a blank canvas. So many possibilities! 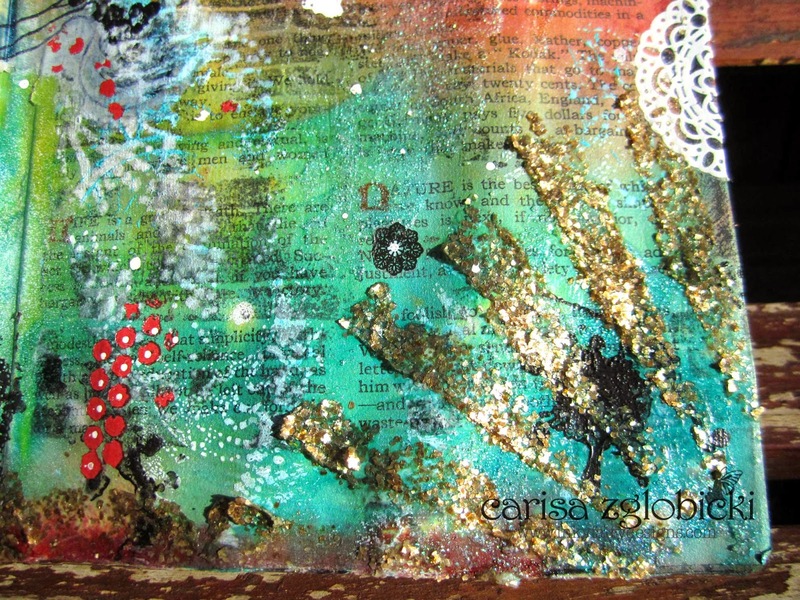 I hope you enjoyed my first Mixed Media Monday and will stop back by for more inspiration! This is so neat! 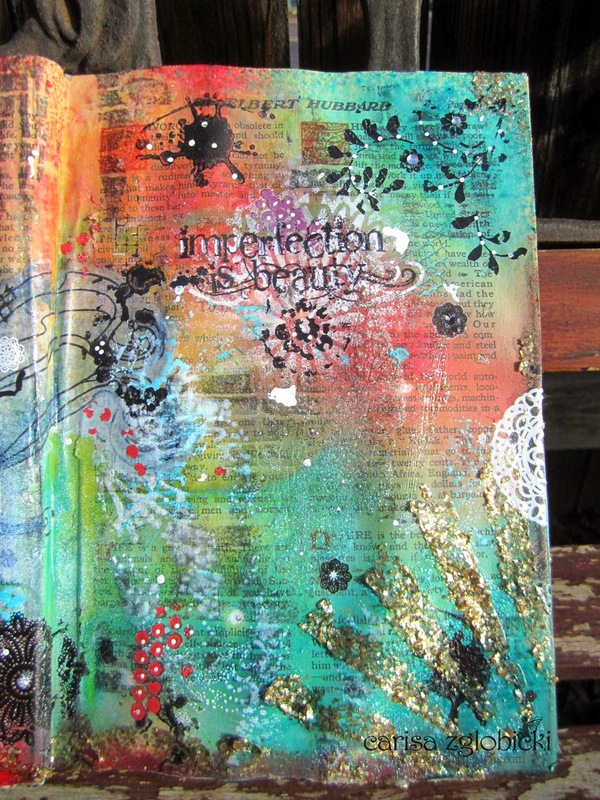 I can see you are really having a fun time with the mixed media as it shows in this work of art!! Keep it up! I love seeing you creating again!